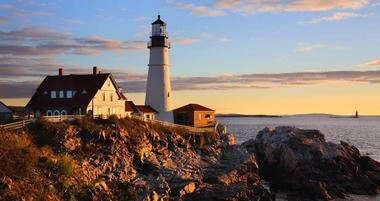 Maine conjures images of rugged coastlines, scenic coastal towns, and a rich fishing and maritime heritage. 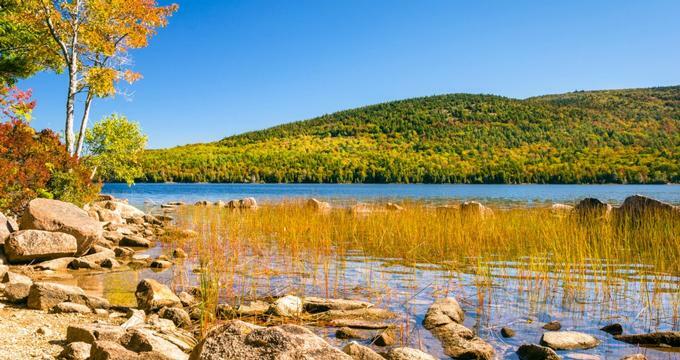 Maine's Lakes and Mountains is a region in western Maine that is part of the iconic Appalachian mountain range stretching the length of the United States' east coast. From a bustling harbor to an array of museums, Portland is a fun city to visit on your weekend trip. Maine is steeped in a history formed by hard-working people and is a wonderful place to visit whether you are a history buff or a nature lover. Camden is a popular summer vacation destination, offering outdoor adventures and unique attractions. Famed for its stunning coastline and quaint fishing towns, Maine can keep both city lovers and nature enthusiasts busy throughout the year. Plan a relaxing summer weekend getaway to one of these romantic inns, B&Bs and lodges in Maine. Kennebunkport has been a popular summer destination since 1870s. Beaches and water activities dominate the things to do list, from sailing and whale watching to swimming and hiking along the coast. Romantic vacation ideas in Maine include beautiful coastal retreats, gourmet getaways, romantic inns and full service spa resorts. Located on the Penobscot River in the central part of the state, the city of Bangor is called the Queen City of the East. Maine is the most northeastern state in the United States. It is known for it’s lobster production, rocky coastline and seafaring history. There are many scenic natural areas offering a range of outdoor activities and opportunities to see wildlife. 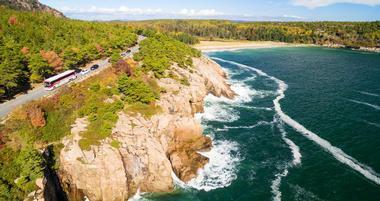 Parks include well-known Acadia National Park and several smaller state parks. Lighthouses dot the rocky coast, whales can be seen offshore and several beaches are also popular among summer tourists. The cities offer museums, interesting restaurants and shopping as well as other interesting attractions. The state has a variety of activities for every season including beautiful fall foliage and winter sports activities such as snowshoeing and nordic skiing. Portland is an old fishing town that has grown into a modern city. The city sits on a peninsula that extends out into the Casco Bay. The Old Port waterfront is a favorite among tourists. It features many fishing wharves that are still in use today alongside warehouses that have been converted and now house restaurants and shops. Visitors also enjoy the Western Promenade for its location which offers views of the mountains and river, as well as its wide variety of family friendly activities. Several historic buildings, mansions, and museums, including a well-rated children’s museum are just a few of the other attractions in the Portland area. Bar Harbour is an island town on Mount Desert Island along Maine’s Frenchmen Bay. The town is a jumping off point for visitors to Acadia National Park and the surrounding mountains. The bayside town has many restaurants, shops and other amenities that make it a popular base for tourists exploring the area. The historic town has several small museum and galleries, and the downtown area has a self-guided walking tour marked by signs for tourists. The surrounding area has plenty to do for those who like the outdoors and adventure. Opportunities for biking, hiking, kayaking and boating abound in the town and surrounding areas. Acadia National Park is a 47,000-acre recreation area that is mostly located on Mount Desert Island. The park’s terrain features rocky beaches, granite mountain peaks and woodlands. 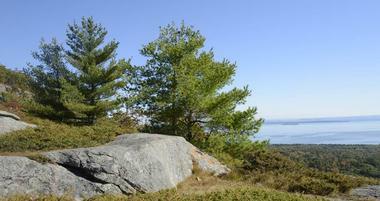 The park contains the highest point on the East Coast - Cadillac Mountain. Activities include hiking the many trails in the park, biking historic carriage roads, camping the park’s campgrounds, and winter activities such as snowshoeing, nordic skiing and snowmobiling. Many wildlife can be seen while exploring the park including moose, bear, seabirds and whales. For those who prefer more of a guided experience, National Park Tours offers guided bus tours throughout the park which include three stops, including one on the iconic Cadillac Mountain. 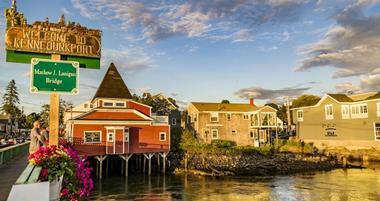 Camden is a small town on the Penobscot Bay along Maine’s southern coast. Similar in feel to Nantucket or Bar Harbor, the town is a well-known summer colony with a population that more than triples in the summer. Popular attractions include Curtis Island with its iconic lighthouse, Barrett’s Cove Public Beach and Megunticook Falls. Several schooners such as the Lewis R. French and the Grace Bailey are based in Camden and offer sailing trips and cruises, some including week-long cruises. While the town is most highly trafficked in the summer, the small, community-owned Camden Snow Bowl ski area draws some winter tourism as well. Bangor, known as the Queen City, is a city on the Penobscot River. The town is only about an hour north of the bustling tourist haven, Bar Harbor. However, the inland town is peaceful year round. Visitors to the city enjoy perusing the shops, visiting the many museums and the exploring the range of outdoor activities in the area. Favorite museums include the Cole Land Transportation Museum and the Maine Discovery Museum, Outdoor attractions include the Orono Bog Boardwalk and Bangor City Forest. Acadia National Park is only about an hour away. The town is also home to horror novelist, Stephen King. Stephen King-themed bus tours of Bangor are popular among his fans. The Bay of Fundy is a beautiful bay on the northeast end of the Gulf of Maine. The Bay only has a small portion of shoreline on the state of Maine as most of it is situated between the Canadian provinces of Nova Scotia and New Brunswick. The Bay boasts status as being one of the 7 wonders of North America and is home to the highest tides on the planet. The Bay is also known for being the site of many significant geological discoveries inclusive of dinosaur fossils and a range of semi-precious gems. The Bay of Fundy is also home to rare species of whales and whale-watching tours are a popular activity. Rockland is a city on the coast of the Penobscot Bay and a popular tourist destination. Annually, the town hosts the world-renown Maine Lobster Festival, honoring their primary export. Other attractions include the famous Farnsworth Art Gallery which is home to the paintings of artist, Andrew Wyeth and other New Englanders. Visitors enjoy browsing the many interesting shops, coffee stores, markets and more. The city is home to the departure port for the Maine State Ferry Service which provides access to the nearby islands of North Haven, Vinalhaven and Matinicus. For a unique experience, visit Rockland via train on one of Maine Eastern Railroad’s excursions from Brunswick. Augusta is a medium sized city and the state capital of Maine. The city is located on the Kennebec River in Kennebec County. Visitors can learn all about state history and governance at the Maine State Museum, the Blaine House and the State House. The city is also home to New England’s oldest surviving wooden fort, Old Fort Western, dating to 1754. Outdoor attractions abound in the Kennebec Valley including Messalonskee Lake and the Viles Arboretum, a 224 acre botanical garden. For those traveling with children, check out the well-rated Children’s Discovery Museum, Bicentennial Park and the Calumet Playground. 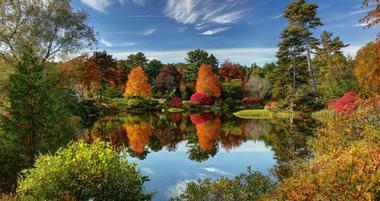 Bath is a small city along the Kennebec River, near Maine’s southern coast. The city is popular with tourists due to it’s 19th-century architecture, proximity to outdoor attractions, lighthouses and interesting museums. The city was historically a sea-going base and is home to the Maine Maritime Museum which provides an interesting look at the city’s maritime past. Several lighthouses along the Kennebec River are popular among tourists including the Doubling Point Light Station, and the Squirrel Point Light Station. There are also several nature preserves in and around Bath including the Thorne Head Preserve and Butler Head Preserve. Many parks and walking trails such as Whiskeag Trail provide even further opportunities for fun in the outdoors. York is a town on the Gulf of Maine near the state’s southern tip. The town is known as a popular summer resort town. The town is a golf haven and is home to three popular 18-hole golf clubs. There are three sandy beaches which are perfect for summer fun. Long Sands Beach is the largest and most popular, and has quite a few options for beachfront accommodations in the summer months. The town has many interesting examples of Gilded Age architecture and features a cluster of preserved historic buildings in the center of York Village which are currently being operated as museums. Lewiston is a city in Southern Maine. The city has significant connections to French Canada as much of the town’s historical development coincided with the migration of French Canadians from Montreal. The town was a former mill town but much of the lumber industry has fallen off in recent years and the city has attempted to re-invent itself as a tourist destination. There are several events and festivals that are hosted in Lewiston each year and draw many tourists and locals including the Liberty Festival, The Great Falls Balloon Festival, and Emerge Film Festival. Tourists who visit Lewiston will also find several interesting museums, a downtown historic district, and several beautiful parks. Ellsworth is one of Maine’s fastest growing cities. The city is also popular among tourists with many interesting historic buildings and other attractions. Some examples of the historic architecture in the city includes the 1935 City Hall and The Grand theater which still hosts various performances throughout the year. Several interesting museums are based in the city including the Telephone Museum and Woodlawn Museum which is also listed on the National Register for Historic Places. Outdoor activities include Birdsacre which is home to the Stanwood Homestead Museum as well as a wildlife sanctuary. Others come to Ellsworth for shopping including the L.L Bean Outlet and several gift and specialty shops. Marginal Way is a mile-long walk along the cliffs, extending along the ocean near Ogunquit Beach. The walk stretches from Shore Road to Perkins Cove. The route passes by the iconic Marginal Way Lighthouse. The footpath is one of the only of it’s kind in New England. Visitors come for the peaceful, salty air and beautiful views of the ocean. The land was donated to the town nearly a century ago and is managed by a non-profit organization. Children will enjoy exploring the tide pools along the walk as well as looking for shells and sea creatures such as hermit crabs and starfish. There is a children’s guide to the Marginal Way as well as a walking map available on their website for free. Mount Desert Island is the largest Island off the coast of Maine as well as the 6th largest in the continental United States. The most famous attraction on the island, and the reason most people visit is Acadia National Park. However, the island is also home to several well-known summer colonies such as Bar Harbor and Northeast Harbor. Several celebrities have summer homes on the island. Most come to experience the natural beauty of the area with attractions such as Cadillac Mountain, Thunder Hole and Jordan Pond. There are many hiking and biking trails throughout the island as well as lighthouses and other interesting sites. The island’s villages offer shopping, restaurants and other services and amenities for tourists. 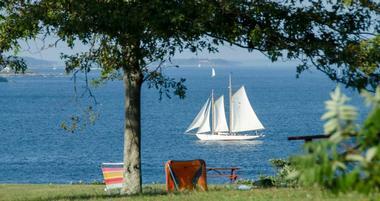 Camden Hills State park is a 5500-acre, publicly-owned recreational area that overlooks the Penobscot Bay in Camden. The park’s property contains both Mount Megunticook and Mount Battie. The top of Mt. Battie offers especially scenic views. The park offers multi-use trails for horseback riding, hiking and mountain biking as well as winter sports such as snowmobiling and snowshoeing. The park also allows hunting. Camping The park is especially nice in fall when the colors are at their peak. For those who are looking for overnight accommodations, the campground at the park has more than a hundred individual sites to choose from. Ogunquit Beach is a beautiful summer resort on Maine’s southern tip. 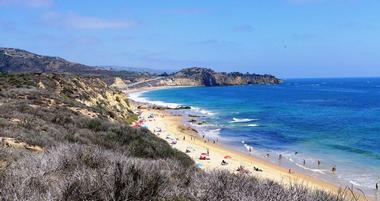 The beach is constantly rated among the top beaches in the country. It is a 3.5-mile stretch of dunes and sandy beachfront. The beach creates a natural barrier between the ocean and the Ogunquit River. The beach is lifeguarded during the main season. There is a middle section of the beach known as Footbridge Beach which can be accessed by a footbridge that crosses the river. Beach access is also available at several other locations along the beach. Facilities include parking, umbrellas, chair rentals, picnic tables and public restrooms. 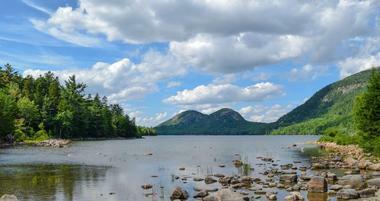 Jordan Pond is located inside Acadia National Park near Bar Harbor. It was formed by a glacier and is approximately 150 feet deep at its deepest. There are steep inclines on both the East and West side of the water. The water in the pond is very clear, with the visibility being approximately 46 feet deep on average. Swimming is prohibited, but canoes, kayaks and other non-motorized boats are allowed on the water. The launch for such boats is at the Jordan Pond North parking lot. There is a full-service restaurant, Jordan Pond House, that overlooks Jordan Pond. The restaurant is the only full-service restaurant located inside Acadia National Park. They serve lunch, dinner and afternoon tea while you enjoy the stunning views. Wells is the third oldest town in Maine and has been a popular destinations for tourists for a very long time owing to its public beaches, seven miles of shoreline on the Atlantic Ocean and other attractions and amenities. Wells Beach is a 1.5-mile stretch of sandy beach that borders both Crescent Beach and the Wells Beach Jetty. The beach is flanked by grassy dunes and there is a rocky section near the entrance which makes it a great place for kids to explore and experience nature. There are many services and amenities on the beach including a snack bar, gift shop, parking, restrooms and more. The Rachel Carson National Wildlife Refuge is comprised of several sections of land that together make up 9,125 acres along fifty miles of Maine’s southern coast. The refuge protects important estuaries which provide an important habitat for several species of migratory birds. A variety of wildlife can be seen in the park including White-tailed deer, raccoons, moose, black bear, snowshoe hair and a large variety of birds and waterfowl. The refuge allows hunting, fishing and shellfishing with appropriate permits and during certain seasons. Photography, canoeing, kayaking and educational programming are other activities that visitors may enjoy at the refuge. Popham Beach State Park is a coastal state park that is situated in an area between where the Morse and Kennebec rivers open into the ocean. It is also located near the coastal city of Bath. The beach is one of the most popular in the state. Fox and Wood islands can be seen offshore and during low tide it is possible to walk to Fox Island. Geologic tours of the beach can be arranged. The park is located nearby Fort Popham, a fortification from the Civil War. The historic site is still being excavated and is said to have been the first colony in today’s New England. Baxter State Park is a large area of wilderness in north-central Maine. The park was comprised out of 28 separate donations of land which together make the park more than 200,000 acres. The park is home to the highest mountain in Maine, Mount Katahdin. 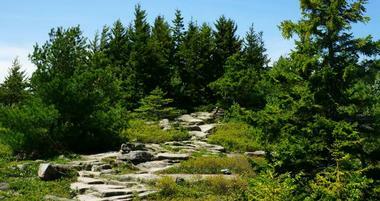 The mountain is 5,267 feet above sea level at its highest point and is the northern end of the Appalachian Trail. There are several lakes in the park including Grand Lake Matagamon, Nesowadnehunk Lake and Webster Lake among many other smaller bodies of water. There are also several streams, creeks and waterfalls. The park is somewhat isolated and has no electricity, running water or paved roads on the park grounds. Sightings of moose and other interesting wildlife are fairly common. Wolfe’s Neck Woods State Park is a state park located on Casco Bay to the southeast of the town of Freeport. The park has more than 200 acres of protected, publicly owned recreation land. There are many trails within the park which pass along the shoreline and through dense forests. 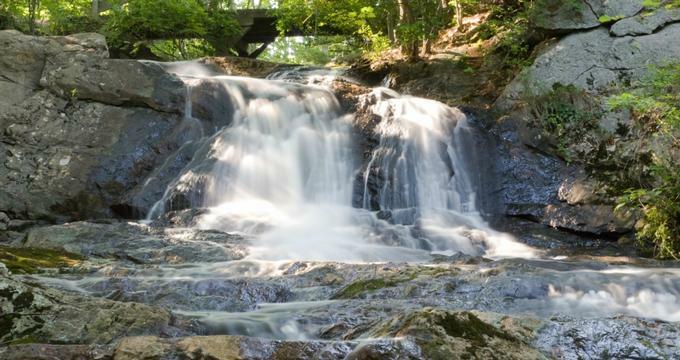 The trails offer scenic views of both the Harraseeket River and Casco Bay. Visitors enjoy hiking, cross-country skiing and snowshoeing on the trails as well as birdwatching and picnicking. Guided nature tours are offered which affords visitors the chance to see baby ospreys in their nests with the use of high-powered binoculars. The park is day-use only, and no overnight camping is allowed. Smalls Falls is a beautiful waterfall made up of a series of cascades and falls on the Sandy River. The waterfalls total 54 feet in height. The falls are accessible via the Smalls Falls Rest Area on Maine Route 4. The rest stop features basic amenities including parking, picnic tables and pit toilets. All of the four waterfalls are set within a beautiful gorge offering a scenic setting to enjoy them. It is especially beautiful in the fall. The waterfalls are separated by pools which are perfect for swimming. The lowest fall has a rocky beach leading to its base with fire pits and bathrooms nearby, making it a popular spot for picnics. Gulf Hagas is a gorge in central Maine’s mountains. The gorge is cut by the western fork of the Pleasant River and has created a vertically-walled slate gorge over the years that features several waterfalls. A scenic hiking trail follows along the rim of the gorge and offers beautiful views of the waterfall and surrounding area. For a short distance, this Gulf Hagas Rim Trail follows along the Appalachian Trail. This section of the Appalachian Trail is called the Hundred-Mile Wilderness and is both the final section of the trail as well as the section deemed by many to be the most difficult and remote.